A recent large study suggests a link between a commonly prescribed antibiotic and retinal detachment. If the photosensitive cells inside the eye pull loose, it is called a retinal detachment and is a true eye emergency. Patients often describe seeing large flashes of light and a black veil or curtain in their field of view. 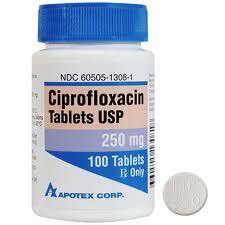 Oral fluoroquinolone use (Cipro is the most common) has been associated with tendon rupture. It is thought there is interference with collagen synthesis and repair. There appears to be a similar effect on collagen in the eye. Patients using fluoroquinolones should be aware of the symptoms of retinal detachment, and those already at high risk might be best served with an alternate antibiotic. High risk eyes are those that have already had a detachment in the other eye, and highly myopic or nearsighted eyes.